Whether your house is the gathering place or you're traveling with food to join the gathering table, this dish is your solution to great mashed potatoes that can be made well ahead of time and they travel well. And this is what I'm bringing to the table this year, joining my huge clan in Tennessee for some so-good southern cooking. Now, get ready, these are not just your average mashed potatoes, but if you've read my blog at least once you already know what to expect from me. That means get out some butter, for one thing. About half a stick for every 3-5 lbs of potatoes and 8 oz of cream cheese, that is. Go ahead and get these out now to soften. I often make this recipe with 10 lbs of potatoes for a crowd and that means at least a full stick of butter and a full lb of cream cheese. My Nanny Hall used to say, "Let your conscience be your guide," where butter was concerned, and then she would go ahead and drop in a whole stick. Try to keep your conscience from interfering at this moment and go ahead and follow the ratios prescribed above. This is holiday cooking, after all. Now put on some potatoes. Let's just give them a rinse and toss them in there whole and unpeeled to make our lives a little easier. I love to use Yukon golds because they're so buttery yellow to begin with and are not dry and crumbly like the Idaho white. Bring to a boil and start checking at about 10 minutes because we want them out of the bath when they are just done and not verging toward that dangerous moment when the starches will turn to sticky goo in the mixer. To figure out about that perfect moment to cut the heat, here's the test. Impale one or two potatoes with a paring knife and if it slips in fairly easily then lift one of the potatoes out. It should hang on for just a second and then slide back into the water. Not done enough if it doesn't slide off. Probably need to get them out quicker next time if they're so soft you can't lift one out on the knife. If you've ever left potatoes boiling for too long and then tried to mash them, you know why this step matters. You could hang wall paper with the paste that results from overdone potatoes which will turn even stickier when beaten. I like to go off and leave these cooling in a colander until they're just cool enough to hold for peeling, though don't let them get cold or again there's the risk of sticky end product. Today I was in too much of a hurry to wait for the heat to subside a bit and couldn't find the industrial strength rubber gloves so I'm using a clean dishcloth to keep from screaming. But this step goes fast with Yukon golds since they have such thin skin it will all pull off in a single piece of two with a little scrape of the knife. Forget the vegetable peeler; it's useless here. Give these a good sprinkle of salt, say a tablespoon or so and nearly as much pepper. Set the beater to medium and let it turn just enough to break everything up. Don't walk away! We're not beating the living daylights out of these. You can see these are still plenty lumpy when we throw in the butter and cream cheese. If the potatoes are stil hot they will melt everything down easily. If you've let them completely cool, then give both butter and cr cheese about 30 seconds or so in the microwave to be sure they're softened and then mix all together at medium speed until just incorporated. Doesn't take long. I only beat these until all is mixed together and than stop because I like some some pieces of potatoes still intact. Of course it's fine to beat them smooth, too. Next we're going to bake them at 350 for 30-45 mintues. OK to do ahead of time so they're completely done when you arrive at your destination. If your table is the gathering place and you want to bake them at the last minute, they will hold in the fridge just like this for several days. Butter one large dish (9x13 or bigger) and layer in the potatoes; keeping them 3" deep or less is best. Then rub a little soft butter over the top. I've used two dishes small enough to fit into the microwave for last minute reheating so that I can bake ahead and store in the fridge overnight to take to the feast. In honor of Thanksgiving, the Food Network is getting the entire food community together to celebrate a huge Virtual Thanksgiving called The Communal Table. Want to join us? 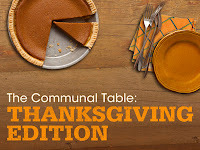 Check out these fantastic ideas for a memorable Thanksgiving table from our other great bloggers! This is comfort food! Love it.